This entry was posted on July 18, 2018 by Herb. Maywood, IL -- The newly redesigned GL1800 sets the standard for long-range touring motorcycles, and VStream Windscreens for the new Wing set that standard even higher. These VStream Windscreens are made in three different heights to fit riders of any size. VStream gets its name from its unique patented shape. The advanced “V” profile and dimensional contours push the wind vortex out and away from the rider's helmet, resulting in an improved riding environment. All polycarbonate windscreens from National Cycle are protected by a 3-Year Warranty against breakage. 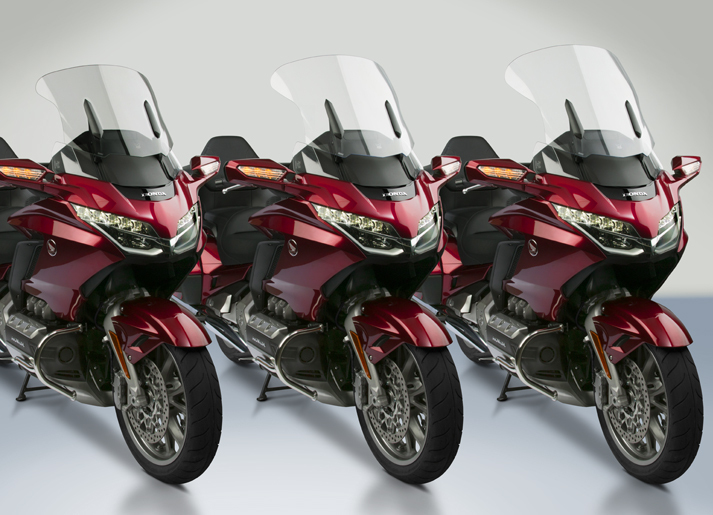 Download high resolution photography of VStream Windscreens for the 2018 GL1800 Gold Wing. National Cycle products are made in the U.S.A.